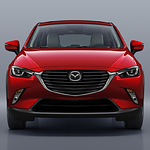 What sets the Mazda CX-3 apart from so many other vehicles is that the safety features are standard. You don’t have to pay extra or go to a higher trim level to get a rearview camera, blind spot monitoring with rear cross traffic alert, or Smart City brake support. All of those are in your SUV no matter what. Other systems are included in the Mazda CX-3, too. You can avoid flat tires easier with the tire pressure monitoring system. If you’re walking to your car in the dark, you can use the keyless remote panic button. The engineers at Mazda have thought of everything.